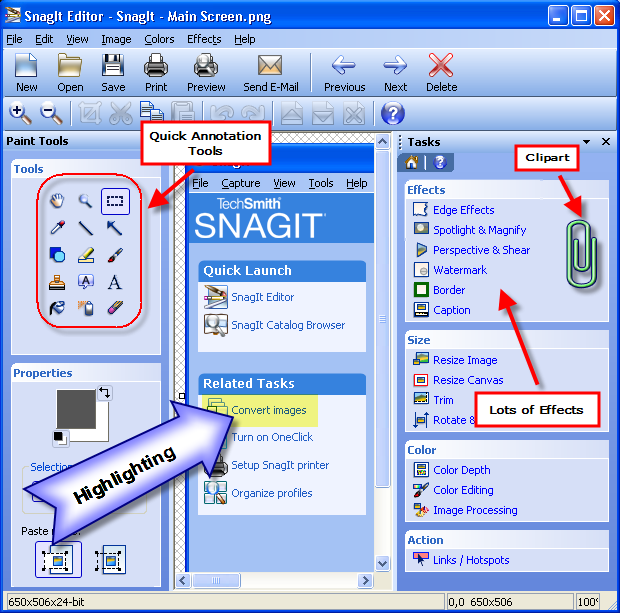 In SnagIt's main form you can select to capture a specific user dragged area of the screen (Region), a specific application's window or dialog (Window), the entire screen (Full screen), or even scrolling boxes like web pages (way cool). 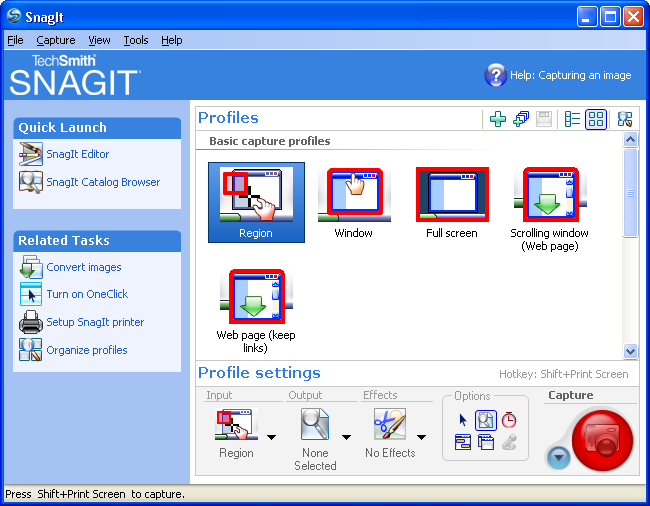 There are also hotkeys for the various capture techniques, including just hit the "Print Screen" button. The "Region" option has a zoom box so you can get down to the pixel relatively easily. After a capture is made, you can mark it up all sorts of ways. Here's a capture of the annotation app and some types of annotation. The editor is so good that I use it to do basic editing (crop & rotate) on my photos too. The window has been squeezed so that it fits in the post. You can check out some other examples of annotated captures here (lots of stuff), here (one a photo), and here (torn edges). From this screen there is easy deployment to the printer, an e-mail, a file, etc. Windows Vista has a basic screen capture tool built-in called the "Snipping Tool" (type "snip" in Vista Search). Here's a post about it and a video. For screen video recording, try their Camtasia program. It is very easy and produces a perfect picture quality using it's own lossless compression. You may want to tweak the audio codec to get good sound at a lower cost, I use the "Microsoft ADPCM" in "44.100 kHz, 4 Bit, Mono, 21 kb/sec" which after much trial an error strikes a good balance of great voice recording quality with small size. Windows Media Encoder is free and also does screen recording, but the coloring in picture is lousy as it uses lossy compression. You can buy SnagIt for $40 from amazon.com or download a 30-day trial from TechSmith. There are a few things I wish it did, like remember some of my effects settings, which I've passed on to TechSmith and they've been responsive. On the whole I've been quite happy with the tool and find it indispensable for communicating in e-mail, on blogs, presentations, screen mockups, etc. It's become an essential part of any PM's toolkit here at MS too. SnagIt suffers from massive bloat. Its so full of crap that it has to point out to you exactly where to go on the UI in order to get simple stuff done. Personally, and as a .NET developer, I prefer Cropper. Its got minimal bloat, is well customizable thorugh plugins (add the features you want rather than bloat up everything), and works well. To take a snapshot, all I need to do is 1) run it 2) position the overlay 3) double click to snap 4) close it. Hi Noah! Thanks for the review. I appreciate it and am passing it on to the SnagIt Team. And, we’re always looking for ways to improve SnagIt. So, keep sending us feedback. Nice work. Funny, I was "JUST" about to write up my own article about Snagit. Great tool which allows you to do just about anything (and many things I’ve not even thought of). Sorry mcgurk!! You like Cropper…you must be joking!! SNAG IT is like so much so much better than Cropper!! I am an instructional designer and I regularly work with screen shots, graphics etc. I think there is no better tool than Snag It for taking screen shots and doing small image editing…Snag It is good. Keep up good work TechSmith Guys!! Your tool is a blessing! one limitation is that you cant take the startup UI on windows or the Start menu on windows. at least i cant find out how to do it.